This post is part of a joint series entitled “Digital Research, Digital Age: Blogging New Approaches to Early American Studies,” published by the Panorama and the Junto. This joint series stems from stemming from a conference entitled “Revolutionary Texts in a Digital Age: Thomas Paine’s Publishing Networks, Past and Present,” organized by Nora Slonimsky at Iona College in October 2018. This series will feature one post every day this week, hosted by both the Panorama and the Junto, and Dr. Slonimsky’s introductory post is found here. The President’s House, courtesy of the author. Revolutionary Texts in a Digital Age Conference at the Institute for Thomas Paine Studies. I posed a question to my fellow panelists and the members of the audience to start my presentation: How can we use the digital re-creation of historic places (and thus the commemoration of these spaces) to bring new viewers into the field and bring together different historical approaches? In the last decade, several incredible three-dimensional re-creation projects have demonstrated the possibility of this technology, including the London Before the Great Fire project, the Ancient Rome project, the James Dexter House site in Philadelphia, and a forthcoming project on eighteenth-century Barbados out of the University of Rochester. These projects preserve the physical elements of history that have very nearly been destroyed, allow visitors to experience the site from across the globe, and offer teachers, students, and teachers the opportunity to draw new conclusions about the lives that took place in this space. The physical space helps us see how the individuals may have interacted with one another and how the space may have shaped their lives and key historical developments. The Cabinet Room, courtesy of the author. While working on my book on the creation of the president’s cabinet, I became curious about the president’s private study on the second floor. In order to determine the atmosphere of the first cabinet meetings, I concluded that I needed to know what the room looked like and what items filled the space. 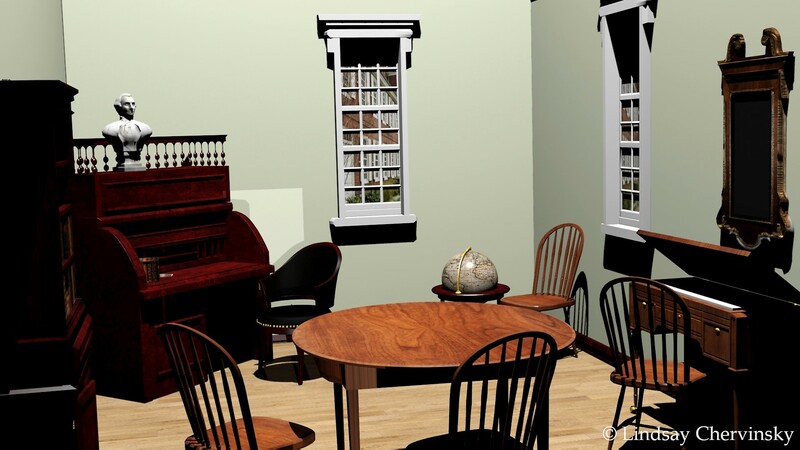 Partnering with the Center for Presidential History and the Guildhall School at Southern Methodist University, I created a 3-D virtual re-creation of the room. I would not have understood crucial cabinet developments without the digital re-creation of the room. For example, the room is fifteen by twenty-one feet. As you can see in the image, it is full of furniture. In 1793, the cabinet met fifty-one times. Most of the meeting occurred in this room during the summer. The cabinet gathered up to five times per week, in meetings last several hours. The cabinet members—President George Washington, Secretary of the Treasury Alexander Hamilton, Secretary of State Thomas Jefferson, Secretary of War Henry Knox, and Attorney General Edmund Randolph—were not small men. By 1793, Hamilton and Jefferson hated each other, and yet were locked in this room for hours, in August, in the Philadelphia humidity, with no air conditioning. These conditions shed new light on the development of the president’s cabinet and the parallel rise of partisan tensions and the first political parties. I would not have been able to accurately describe the cabinet meetings without understanding this physical space. I believe the house offers similar insights about the diplomatic and political precedents established in this space, as well as a more comprehensive picture of eighteenth-century urban life, and I plan to expand the project to re-create the entire house. For example, a student asked me why the cabinet met in Washington’s cramped study, when larger spaces (like the drawing rooms or dining rooms) were available. Washington left no written evidence to answer this question, so I hypothesize that the study offered the best chance for privacy in a very crowded home. Over thirty people lived and worked in the house, and the dining rooms and parlors were public or shared spaces. The family frequently ate their meals, received guests, served tea, or played music in these rooms. Furthermore, enslaved workers and hired servants needed access to clean the rooms or prepare for the next event. Finally, these rooms had two entrances and so the risks of eaves-dropping or accidental interruptions were higher. The house also reveals the pervasive nature of slavery, especially in elite urban dwellings. Many of the enslaved workers slept in dormers on the third and fourth floors. In order to access their rooms, they walked by the public entertaining spaces, the president’s study, and George and Martha’s bedroom. Enslaved workers were not confined to work spaces in the back of the building, and this house demonstrates that lived reality in an accessible way. In October, I ended my presentation with a call to action, encouraging historians to explore the options of digital re-creation, which I would like to extend to this roundtable as well. This project is just one example of how digital projects can bring together different groups of scholars and open lost historical spaces to students and teachers. Right now, the historical field is consumed with efforts to increase the number of history majors, convince public audiences of the value of historical thinking, and demonstrate the relevance of history in this tense political climate. Digital re-creation is an incredible tool to achieve these aims. 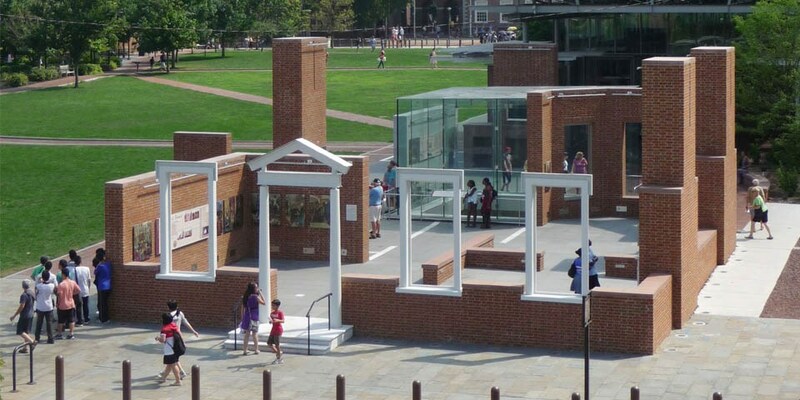 1 For more on the limitations of the exhibit and the controversies over the planning of the site, see Jill Ogline, “‘Creating Dissonance for the Visitor”: The Heart of the Liberty Bell Controversy,” Public Historian, 26 (Summer 2004), 49‒58; Gary B. Nash, “For Whom Will the Liberty Bell Toll? From Controversy to Cooperation,” Slavery and Public History: The Tough Stuff of American Memory, ed. James Oliver Horton and Lois E. Horton (New York, 2006), 75‒102. For the timeline of the controversy, see http://www.ushistory.org/presidentshouse/controversy/index.php. Lindsay M. Chervinsky is White House Historian at the White House Historical Association.